Colombia has taken a quantum leap forward and has advanced in the Gastronomy world. Bogota’s food scene has changed thanks to chefs like Leonor Espinosa, Harry Sasson, and The Rausch Brothers, Jorge and Mark, among others. will prove to the world that she is that kind of woman and cook. That she cares about her people and the local products of The Pacific, Caribbean and Amazon regions. Through her flagship, Leo, located in Bogotá for more than a decade, Espinosa has shown the homegrown ingredients of these regions in one plate, with dishes like yogurt cheese limonero ants and native potato; indios, tallo leaves, three meat gravy and Andean tubers; or the kapeshuna, native read bean, Santa María de Anís, mushrooms, from the desert and humid forest; heart of palm, sabajón, feijoa, as examples of the tasting menu in her restaurant. She received the Basque Culinary Prize 2017 for her work with Funleo Foundation, where she has given pride and recognition to the indigenous Afro-Colombian people, and she has guided them to transform their cultural and great heritage into tools for socio- economic development. Funleo is led by her daughter, Laura, who is also head sommelier at Leo. Misia is their casual restaurant, where you can enjoy street food like carimañolas filled with meat, arepa de huevo or boyacense and empanadas, filled with potato. There are 30 different fruit juices available. Harry Sasson is the Best Restaurant in Colombia 2017. Harry, (the restaurant is named after his name) has become a favorite chef in the city since he opened his first restaurant (located at la Zona T of Bogotá), H.Sasson, Wok & Satay Bar, in 1995. Since then, he has become a magnet for colombian society. to visit Ocati, one of the known fincas that exports tropical fresh premium fruit to supermarkets, fruit store chains and wholesalers in Europe, America and Asia. Tree tomato, purple passion fruit, dragon fruit, feijoa, soussop and granadilla are some of the favorite fruits in the country, harvested the whole year round. 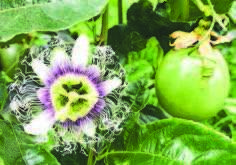 Ocati exports 9 tons of passion fruit a week. Ana Belén, known as La Chefcita, presented her project La Chiva, a rustic bus adapted to rural public transportation. The top of the bus (known as la marranera) was used for carrying potatoes, onion, rice and alive animals. The Chiva has changed with time, and now is a particular tourism experience around the country. Chefcita will transform it into a mobile dining room and will travel around Colombia sharing its local food.